it’s Fab Friday Post (#FabFridayPost), hosted by the lovely Su from Ethan & Evelyn, who has asked me to help out for the week. What a great way to join back up with a lovely community! Thank you to everyone who joined in last week. Pop over to Su’s page to see last week’s choices for Blogger of the Week. If you join up this week you have a chance to be featured too! Come and share your posts with us today! This linky is an Open linky for everyone and anyone who would like to share any topics. Be it about anything relating from parenting, lifestyle, crafts, reviews and related competitions. Please keep it friendly, we really would like everyone to enjoy their time on this little linky here. Either myself or Su (or if you are lucky you get both of us!) will comment on your link and we will pick two to be featured on next week’s #FabFridayPost blog. Link up to 2 posts – old or new. Add #FabFridayPost Badge, or a linked text. 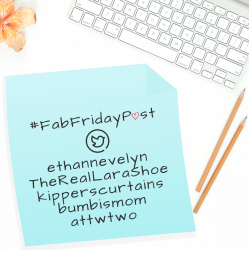 Tweet #FabFridayPost @ethannevelyn and @FamilyMakes and we’ll RT back. Comment on 2 other posts, including the one directly in front of you. Share the love – please do not drop and run away! Don’t be a party pooper. You’ll find the more you put in the more you’ll get. Tweet all posts you have read with #FabFridayPost hashtag. Share the love! After all, this is what it is all about! And if you’re lucky Su will also schedule your posts on socialoomph to be re-tweeted for numerous times throughout the year too! If you’d like to keep following me and the other co-hosts, and tagging on Twitter, Instagram, Facebook and Pinterest – it would be fab and I will then RT, Like or repin your posts. Thank you. I look forward to reading all your posts soon!